Designation: DGM/FST/ UG-Université 08 Mai 1945 Guelma. List of Author(s): Badis Bendjemil, Mohamed Mouyane, Jacques G. Noudem, Jérôme Bernard, Jean Miche, Reboul, Yannick Guel, David Houivet. Copyright: © 2018 Bendjemil1 B, et al. This is an openaccess article distributed under the terms of the Creative Commons Attribution License, which permits unrestricted use, distribution, and reproduction in any medium, provided the original author and source are credited. The purpose of this work is to decrease or eliminate porosities in ETE-VC products with sintering additives. The Ti–C system has been synthesized for its advantages for refractory, abrasive and structural applications. We attempted to density TiC by using iron addition; this metal is introduced through a secondary reaction 3TiO3+Al. This mixture reacts exothermically ϪH298 = -1072.7 kJ and the heat are released according to by Fe addition 3TiO3+4Al+3C+xFe→3TiC+2Al2O3+xFe. X-ray diffraction analysis indicated that intermetallic Fe3Al, TiC and Al2O3 are the main phases formed in the reinforced high performance ceramicmatrix composites and the additions of Fe decreased the lattice parameter of TiC. 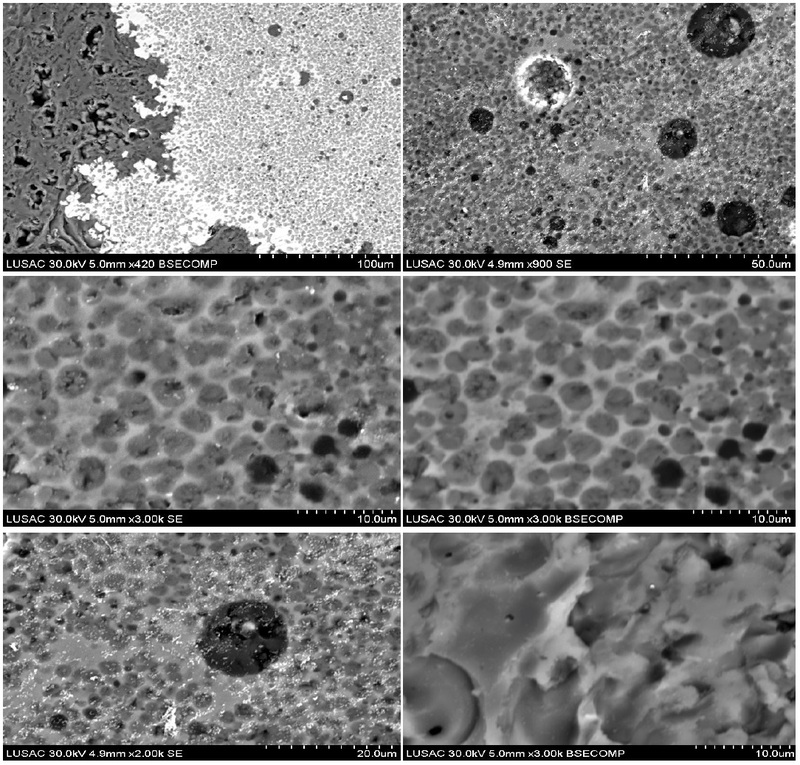 Field emission scanning electron microscopy examinations showed that the addition of Fe decreased TiC particle size and changed their growth controlling mechanism. Also, Raman spectroscopy analysis showed that at higher Fe contents, oxygen dissolved in the TiC crystal structure leading to the formation of titanium oxy-carbide with lower lattice parameter and residual un-reacted carbon in the products. The adiabatic temperatures for the reactions containing % Fe estimated using the thermodynamic data. Thus, doping method is finally used to fabricate materials by ETE-VC method (volume combustion method) for industriel applications. 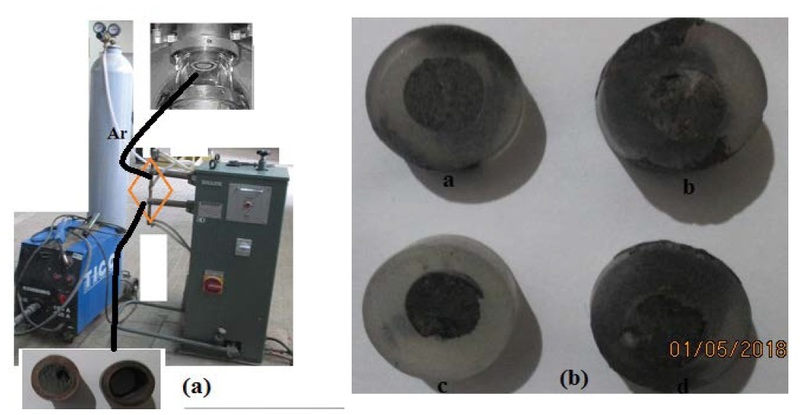 Thermal explosion reaction, TiO2–Al–C–Fe system, Raman analysis, TiC growth mechanism, High performance ceramics matrix composite. If a metallic element is added to this reaction and it only acts as a diluents agent, different metal matrix composites consisting of TiC and Al2O3 particles as reinforcements can be created. Xia and others  produced Al–TiC–Al2O3 composite by adding excess Al to reaction 1. They showed that the critical molar ratio of excess aluminium, which the combustion reaction can self-sustain with a preheat temperature of 400–500 K is 7.66 mol. 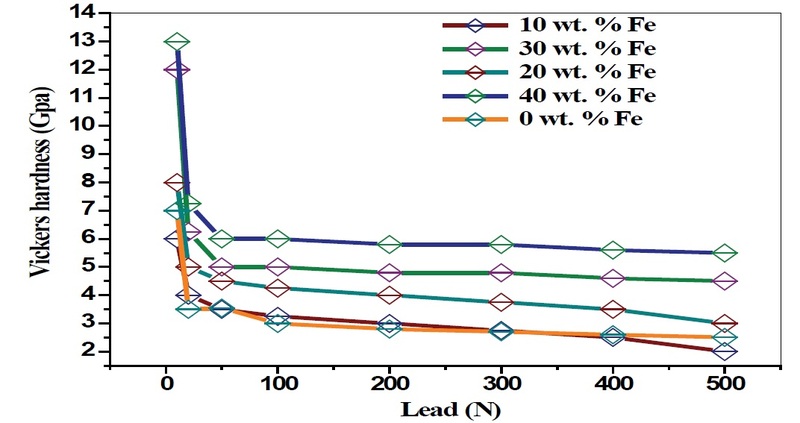 Zhu and co-workers  controlled C/TiO2 molar ratio to fabricate different composites including Al3Ti–Al2O3, Al3Ti– Al2O3–TiC and Al2O3–TiC. Recently some attempts have been performed for fabricating Fe–TiC–Al2O3, composite from ilmenite concentrations by carbo-aluminothermic reduction process [3,20]. But, there is no report on the effect of Fe additions to the aluminothermic reduction of TiO2 in the open literature. So, in the present work we added various amounts of Fe to reaction1 and investigated the effect of this parameter on microstructure and phases that are formed after ETE-VC. The precursors used in this work are were titanium oxide (TiO2 Anatas, purity higher than 99.5 %, 45μm), activated carbon (Merck, 102184), fine aluminum powder (Rankem, A2265) and iron powder (purity higher than 99 wt. % ≤ 100 μm). According to the above calculations, the amounts of Fe added to the reaction were between 0 and 60 wt. % before ETE-VC. To obtain homogenized and fine powder mixtures, the powder mixtures were ball-milled at a high speed of 200 RPM for 30 min by using WC balls (diameter: 3 mm) to powder ratio of 10:1 using balls to produce a homogenous mixture. Then, the mixtures were pressed in a tool cooper die and cylindrical compacts with 10 mm diameter, and 20 mm of thickness and 60% of theoretical density was prepared. The ETE-VC process was performed in argon atmosphere with purity higher than 99 wt. %. Figure 1 shows a schematic representation of ETE-VC chamber. Prior to ETE-VC, the argon gas was purged into the chamber with a flow rate of 6 l/min for 4-6 min to ensure that the air in the container is minimized. Also, during synthesis and cooling of samples, the gas flow rate was kept constant at 4 l/min. The necessary heat for ignition of the reaction was provided by passing a 10000 Amperes electrical current through two cooper electrodes with 20 mm in diameter. The green compact is placed in between. (a)- Schematic representation of ETE-VC chamber and (b)- produced samples. Figure 1: (a)- Schematic representation of ETE-VC chamber and (b)- produced samples. To characterize the reaction products, X-ray diffraction (XRD) analysis was performed with Cu Kα radiation. Raman spectroscopy was performed using a dispersive Raman microscope with a confocal depth resolution of 2μm, spectral resolution of b 3cm−1 and spectral range between 160 and 3500 cm-1 by 785 nm laser. Spectra were taken from different points of the samples to determine the homogeneity and to identify various compounds formed in the samples. Also, microstructures of the products were studied u sing a field emission scanning electron microscope (FESEM, Cambridge S360). The wear resistance and the friction coefficient will be performed in the near future. The mirohardness (H), the elastic modulus (E) and the toughness (KIC) of the fabricated samples were measured under ambient conditions using the instrumented Vickers indentation method (ZwickRoell, ZHU 2.5 apparatus). Where Hv was the Vickers hardness, a was the half-length of the indentation diagonal and c was the half-length of the median crack generated by indentation. Generally, the fracture toughness measured by IF method were fluctuating values with relatively large deviations due to the phase distribution and measurement errors of calculation. Thus, a linear regression model was applied to get a reliable value of indentation fracture toughness . Is the difference between the formation of molar enthalpy of the products and raw materials at 298 K, n is the mole of each product and Cp is the molar heat capacity. If there is any phase change in products during heating, it should be considered in the calculations. So, in the previous formula, Ttr is the transformation temperature and ΔHtr is the molar enthalpy of transformation. Also, if a material is added to the reaction as diluents, its heat capacity should be added to the product’s heat capacity. Combustion wave is dependent on the heat generation by the reaction and heat dissipation to the surrounding area and remaining reactants. The low adiabatic temperature of a reaction indicates that the heat generated by this reaction is low and therefore this reaction cannot propagate in a stable mode . According to the experimental criterion of Merzhanov [9,10], in an exothermic reaction if the calculated adiabatic temperature is higher than 1800 K, it can be volume combustion and the process is (ETE). The effect of Fe additions on the adiabatic temperature of reaction2 is shown in Figure 1. Also, thermodynamic data used for calculating the adiabatic temperature is presented in Table 1. According to Figure 2, adiabatic temperature of the aluminothermic reaction of titanium oxide is 2371 K and addition of iron decreases it with a non-uniform trend. The two steps at 2325 K and 1809 K are above calculations, the amounts of Fe added to the reaction were between 0 and 60 wt.%. 60 % of theoretical density was prepared associated with the melting of alumina and iron, respectively. According to thermodynamic calculations, if the iron added to the reaction is lower than 53.14 wt. %, adiabatic temperature is higher than 1800 K and it is expected that the reaction will be volume combusted. 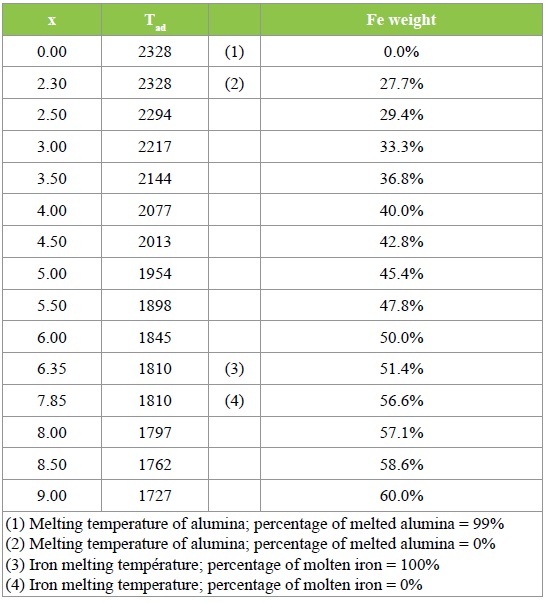 Table 1: Data of adiabatic temperature (K) function of the iron concentration (wt. %). Effect of Fe additions on adiabatic temperature of reaction 2. Figure 2: Effect of Fe additions on adiabatic temperature of reaction 2. The adiabatic temperature for reaction 2 with 10 and 20 wt. % Fe is 2325 K which is considerably higher than the Merzhanov criterion (1800 K). This criterion is based on experimental results and it is verified in many ETE-VC in comparison with SHS reaction systems . So, to reveal the reason(s) why it is not applicable for reaction 2, phase analysis was performed on the products to investigate the effect of iron addition on phases formed after volume combustion. The calculation of theoretical adiabatic temperature for this reaction suggests that iron can be added to this reaction up to 56.38 wt. % and it will remain volume combustion according to Merzhanov criterion . But, first experimental investigations showed that in the sample containing 30 wt.% Fe, the reaction only happened in a thin top surface layer of the compacted powder and then it ended which means that the reaction does not propagate in the ETE-VC mode for this sample. These results are inconsistent with the theoretical results. XRD analysis indicated that the reaction products consist of TiC, Al2O3 and Fe3Al intermetallic phases. These reaction products are not the same as the product of reaction 2, because in this reaction it was expected that Fe would not participate in the reaction and act only as a diluents agent. But, experimental results showed that some of the aluminum was reacted with iron to form a Fe3Al phase. This temperature range is lower than that for ignition of the reaction between aluminum and TiO2 (1173 K) . So, with the reaction of some of Al with Fe, there will be lack of aluminum for complete reduction of all the TiO2 to Ti. Choi and Rhee  indicated that reduction of TiO2 with aluminum proceeds by way of Ti3O5, Ti2O3. XRD analysis of the samples which contains 20 to 40 wt. % Fe is demonstrated in Figure 3. The only phases formed in the sample with no Fe are titanium carbide (TiC, ICDD card no. 00-003-1213) with a cubic crystal structure and aluminum oxide (α-Al2O3, ICDD card no. 01-071-1126) with rhombohedral (hexagonal) crystal structure. 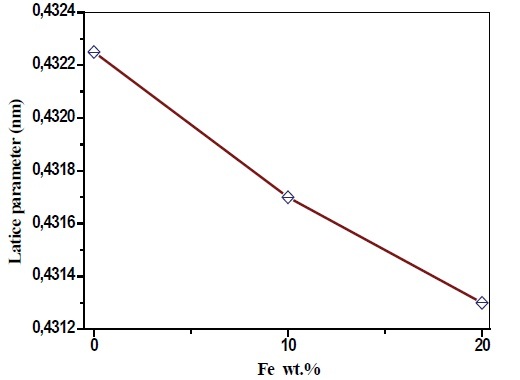 The addition of 10 wt.% Fe had no considerable effect on XRD pattern, but in samples containing 20 and 40 wt.% Fe, the only phase added to the products was iron aluminide (Fe3Al, ICDD card no. 00-045-1203) with a cubic crystal structure. So, reaction products formed in the reactions containing Fe were not as the same as predicted by reaction2. The lattice parameter of titanium carbide was calculated from the XRD patterns using Brag’s equation and Nelson–Riley function [3,22]. XRD analysis of samples with 20 and 40 wt.% Fe. 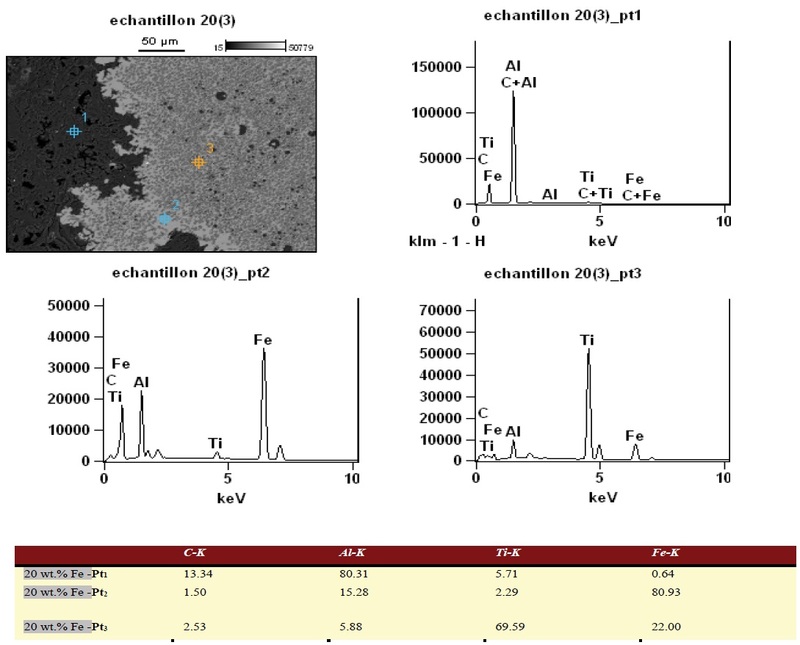 Figure 3: XRD analysis of samples with 20 and 40 wt.% Fe. Where θ is diffraction angle, is the lattice parameter which is determined by Eq. (7) and a0 is the true lattice parameter of TiC which is calculated by Eq. (6). Using XRD patterns, we can draw the variations of lattice parameter versus Nelson–Riley function and extrapolate the true lattice parameter at θ=90. Figure 4a and b shows Nelson–Riley function diagrams used for calculating lattice parameter of TiC in samples containing 20 and 40 wt. % Fe and variations of synthesized TiC lattice parameters with iron addition, respectively. Also, the lattice parameter of stoichiometric Ti0.5C0.5 is indicated in the Figure 5. Nelson–Riley function diagram for samples with different Fe contents. 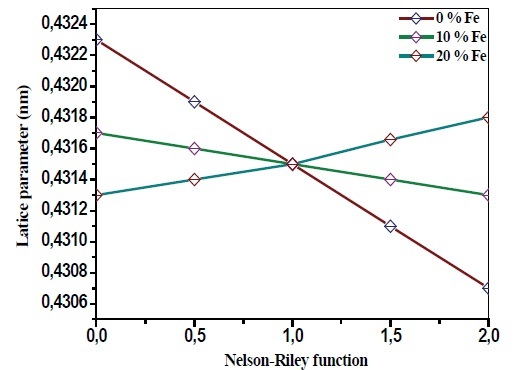 Figure 4a: Nelson–Riley function diagram for samples with different Fe contents. variations of TiC lattice parameter with Fe additions. Figure 4b: variations of TiC lattice parameter with Fe additions. FESEM microstructures of polished and etched surface of samples with 10 wt.% Fe. Figure 5a: FESEM microstructures of polished and etched surface of samples with 10 wt.% Fe. FESEM microstructures of polished and etched surface of samples with 20 wt.% Fe. 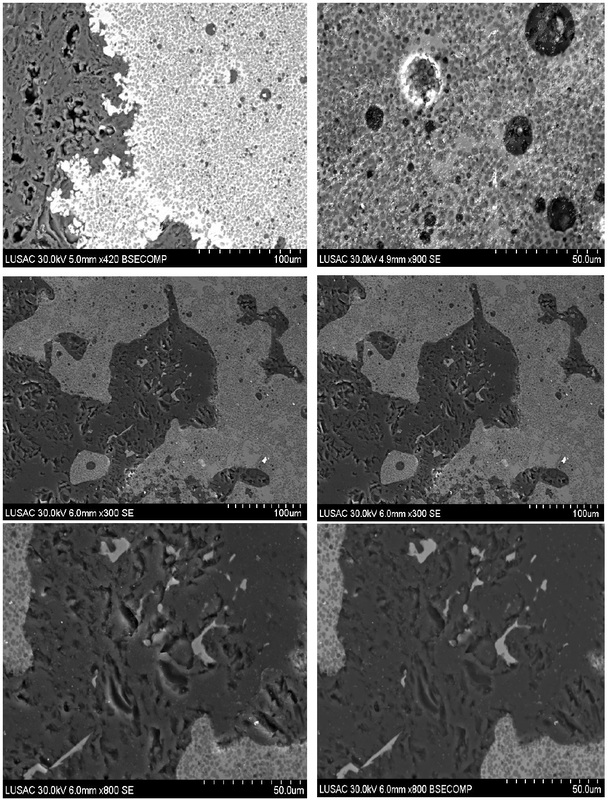 Figure 5b: FESEM microstructures of polished and etched surface of samples with 20 wt.% Fe. FESEM microstructures of polished and etched surface of samples with 40 wt.% Fe. Figure 5c: FESEM microstructures of polished and etched surface of samples with 40 wt.% Fe. As can be understood, the lattice parameter of titanium carbide in the sample synthesized without Fe is lower than that of the stoichiometric one and decreases with the increase of Fe content in the reaction. Different literature that used SHS for synthesis of TiC and composites containing this compound showed that during combustion synthesis, carbon content in the TiC is usually lower than stoichiometric and therefore its formulation represented as TiC1−x (x ≤ 1) [3,23,24]. Storms  indicated that by decreasing carbon content, lattice parameter of TiC falls. So, a possible reason for lower lattice parameter of TiC in the sample with higher Fe may be decreasing carbon of this phase. Another reason for this phenomenon may be the dissolution of oxygen in the crystal structure of TiC and formation of titanium oxy-carbide. Titanium carbide (TiC) has a NaCl face centered cubic (FCC) crystal structure. TiO also has the same crystal structure of TiC. So, they can form a series of continuous solid solutions like TiC1−xOx (0 ≤ x ≤ 1). Titanium oxy-carbide (TiC1−xOx) is an intermediate produce usually observed during carbothermal reduction of TiO2. Jiang et al. showed that as TiO increases in the titanium oxy-carbide phase, lattice parameter of this phase falls from 0.4324 nm for TiC to 0.4194 for TiO . TiO mid-products to form Ti and Al2O3. Similar results were presented by Khoshhal and co-workers  and Zou et al. during aluminothermic reduction of ilmenite. Because there was not any peak related to the TiO2in the XRD patterns and the characteristic peaks of this phase in the Raman spectra were weak, so it is expected that the quantity of this phase is low in all samples. Therefore, the lack of aluminum for complete reduction of TiO2 caused partial reduction of it and formation of lower titanium oxide like Ti3O5, Ti2O3 and TiO and Al2O3. 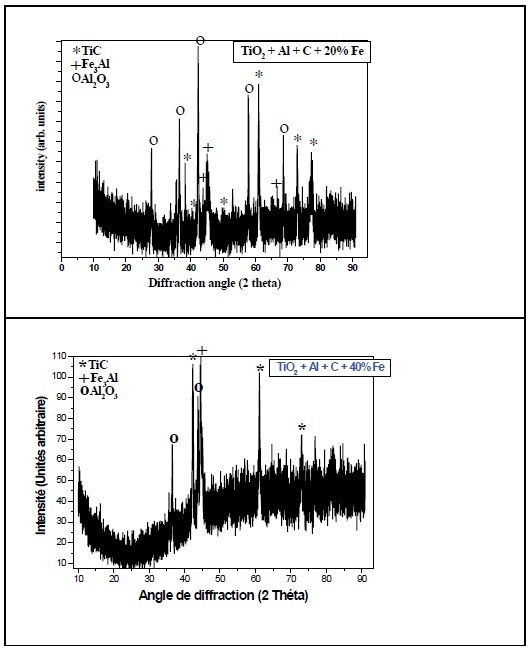 Then these oxides reacted with carbon to form oxy-carbide (TiC1−xOx) as indicated by XRD analysis through decreasing of lattice parameter of TiC and characteristic peaks of this phase in Raman spectroscopy results. Comparing the lattice parameter calculated for Ti(C, O) in the sample containing 20 wt.% Fe with that proposed by Jiang et al. , it is anticipated that the maximum oxygen content of titanium oxy-carbide (x) will be 0.3 and so the chemical formula of the oxy-carbide is TiC0.7O0.3 in this sample. The presence of TiO2 peaks in the Raman spectra of samples containing 10 and 20 wt.% Fe may be because of this fact that raw materials were not uniform and adding Fe to them raised the distance between TiO2 and Al particles. So, in some places of the compacts, Al and TiO2 might not be in contact together and therefore no reduction happened. In reaction 2, it was expected that all the carbon reacts with Ti to form stoichiometric titanium carbide. But, Raman analysis of the sample with no Fe showed characteristic peaks of unreacted carbon. In other words, it indicated that in the aluminothermic reduction of TiO2, all the carbon did not react with the titanium. So, the titanium carbide formed would not be a stoichiometric one and its chemical formula is TiCx (x ≤ 1). This result is in agreement with the difference observed in Figure 6 between the lattice parameters of the stoichiometric TiC and that measured for synthesized TiC in the sample with no Fe. When the amount of Fe added to the reaction increased, more aluminum was used in the reaction with Fe, so the volume fraction of reduced Ti falls. As a result, the quantity of titanium oxide mid products and the possibility for the formation of titanium oxy-carbide with higher oxygen content and lower lattice parameter increased as shown in Figure 6. Also, the increase of oxygen in the titanium oxide midproduct and the decrease of combustion temperature with the addition of Fe reduced the amount of carbon participated in the reaction and led to the increase in volume fraction of un-reacted carbon in the final products as indicated by the amplification of carbon peaks in the Raman spectra of samples with higher Fe contents (Figure 7). It should be noted that the possibility of reducing the remaining TiO2 with excess carbon (carbothermal reaction) in the samples containing Fe is low due to the two following reasons: first, according to thermodynamic data, the standard Gibbs free energy of the reaction between TiO2 and carbon is positive below 1473 K and therefore this reaction proceeds at very high temperatures (1973-2373 K) in argon atmosphere . 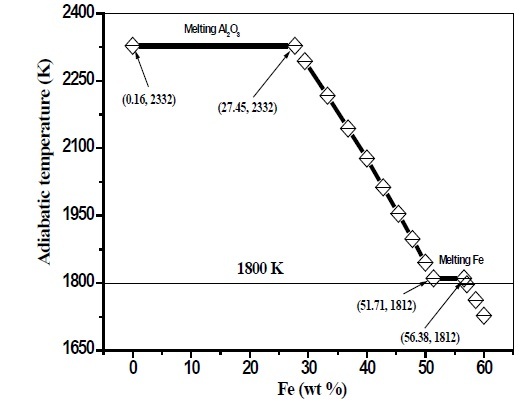 As indicated in Figure 1, the adiabatic temperature of the aluminothermic reaction is 2371 K and adding Fe to the reaction decreased it considerably. Usually, the combustion temperature of an ETE-VC reaction is lower than the adiabatic temperature due to the heat loss to the surrounding area [8-9,16]. So, it is expected that as the Fe was added to the reaction, the combustion temperature decreased which lowered the possibility of carbothermic reaction. Second, carbothermal reduction of TiO2 needs high reaction times (10-24 h) . But, the reaction times for small SHS samples are in the range of seconds to a few minutes. So, one can expect that although this reaction can happen during SHS of the present samples, especially in the samples with lower Fe contents due to their higher combustion temperature, but, the extent of its propagation was not high and therefore the amount of carbon used for carbothermic reduction of TiO2 was negligible. Microstructural representation of produced samples, analysis displays elemental analyses of the various regions of the sintered samples. Secondary electron image, atomic concentration cartographies of Fe, Ti, Al and C of polished and etched surface. Figure 7: Microstructural representation of produced samples, analysis displays elemental analyses of the various regions of the sintered samples. Secondary electron image, atomic concentration cartographies of Fe, Ti, Al and C of polished and etched surface. According to the above Results and Discussion sections, it is expected that the right pass for reaction 2 will be as follows: Figure 9 shows the effect of Fe on adiabatic temperature of reaction 6 which was estimated using the thermodynamic data of Table 1 with this assumption that at low oxygen content, the thermodynamic properties of titanium oxycarbide (TiC1−xOx) are the same as those of titanium carbide (TiC). The effect of Fe on adiabatic temperature of reaction2 is also shown on the figure for comparison. It is observed that the adiabatic temperatures of reaction 6 were 1916 and 1421 K for the samples containing 15 and 20 wt. % Fe which are respectively higher and lower than Merzhanov criterion. So, these new calculated values are consistent with the Merzhanov criterion and experimental observations shown in Figure 4. As shown earlier in Figure 4, the reaction is stable for the sample containing 15 wt% Fe, but, not stable for the sample containing 20 wt. % Fe. So, the Merzhanov criterion is satisfied between these two values as indicated in Figure 9. It is worse noting that if 20 wt. % Fe is added to reaction6, the amount of oxygen (x) in theta (C1−xOx) phase will be 0.29. This result is in agreement with the lattice parameter of titanium oxy-carbide purposed by Jiang  and that was calculated in Figure 6. 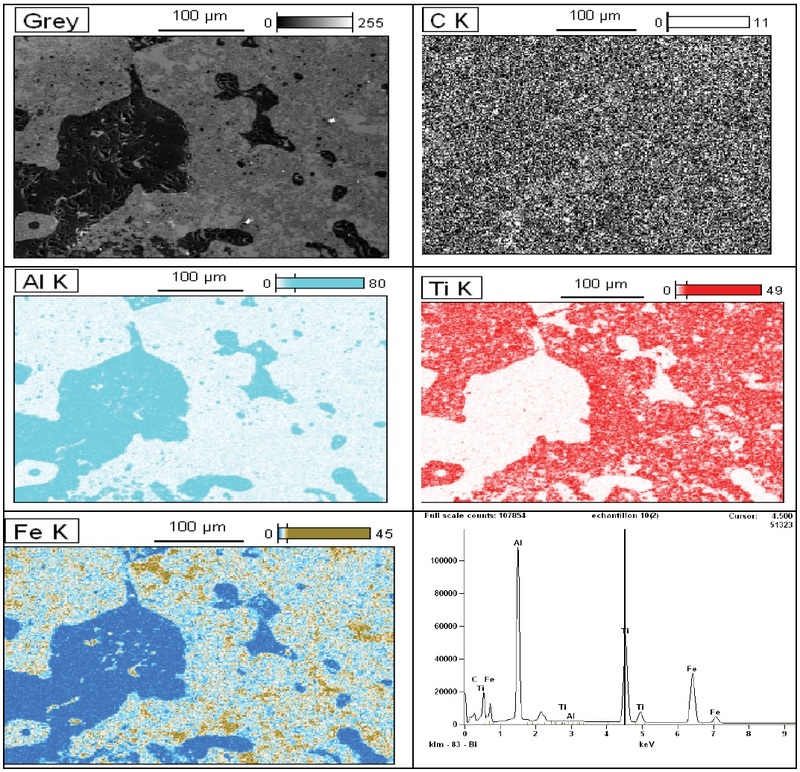 The FESEM microstructures of the surfaces of samples are illustrated in Figure 5. Indicate the presence of higher density in the final structure of the products . The microstructure of the sample with no Fe consists of large Al2O3 grains and TiC particle sintered together (Figure 5a). The addition of 10 wt. % Fe to the reaction changed the morphology of Al2O3from the large plate like grains to slightly finer grains with near spherical morphology. Also, TiC grain size decreased, and they became almost spherical in this sample (Figure 5b). In the sample containing 20 wt. % Fe, the TiC particles became finer, with a particle size between 2 and 6 μm (Figure 5c). It is interesting to notice that there is repeating step on some surfaces of the TiC particles. These steps are characteristics of crystal growth with interface-controlled growth mechanism. Usually, crystal growth in the vapor phase or melt is controlled by three different mechanisms, including diffusion in the melt or vapor, latent heat flow from the crystal-melt interface and reaction at the crystal interface or interface-controlled continuous and lateral growths.growth . The interface-controlled growth mechanism is divided into two different categories named. In continuous growth, atoms can attach to the crystal surface at any point of the growing surface. In these conditions the interface grows uniformly. But, lateral growth leads to the movement of a step across the interface and the atoms only can attach to the step. The step height can be one, several or a great number of atom layers (macro steps) depending on its lateral growth rate and will be higher for a layer with a slower edge growth rate. There are two types of lateral mechanisms, as surface nucleation and screw dislocation. In surface nucleation mechanism, new steps are nucleated on top of each other and form a pyramidlike interface . On the other hand, the screw dislocation model proposed by Hilling and Turnbull  puts on that screw dislocations emerge from the growing crystal face and cause the formation of repeating step like an Archimede an spiral . There are some evidences for the formation of two dimensional nuclei on some surfaces of TiC particles. So, it seems that surface nucleation-interface controlled growth mechanism is the growth controlling mechanism of TiC particles in this sample. Figure 8 shows the different magnifications of the fracture surface in the sample containing 20 wt. % Fe. It can be seen that TiC particle size decreased slightly, but their morphology is transformed into cubical particles with faceted morphology. According to the statements of Kirk Patrick faceted , taught there is not a theoretical justification, Cahn et al. suggested that crystals with non-faceted morphology grow by continuous mechanism while crystals with faceted morphology, grow with lateral growth mechanism. Choi and Rhee  suggested that the alumino thermic reduction of TiO2 is controlled by the diffusion of carbon through solid TiC. So, it seems that the addition of Fe to the reaction changed the mechanism controlling the growth of TiC particles from diffusion-controlled growth in the sample without Fe to lateral growth interface-controlled mechanism for samples containing Fe higher that 10 wt.%. The addition of higher Fe to the reaction caused the decrease of TiC particle size and porosity volume fraction in this ample. Raman spectroscopy analysis of samples with 20 wt.% Fe and d: Raman spectra of TiC and Carbon active in samples with different Fe contents. 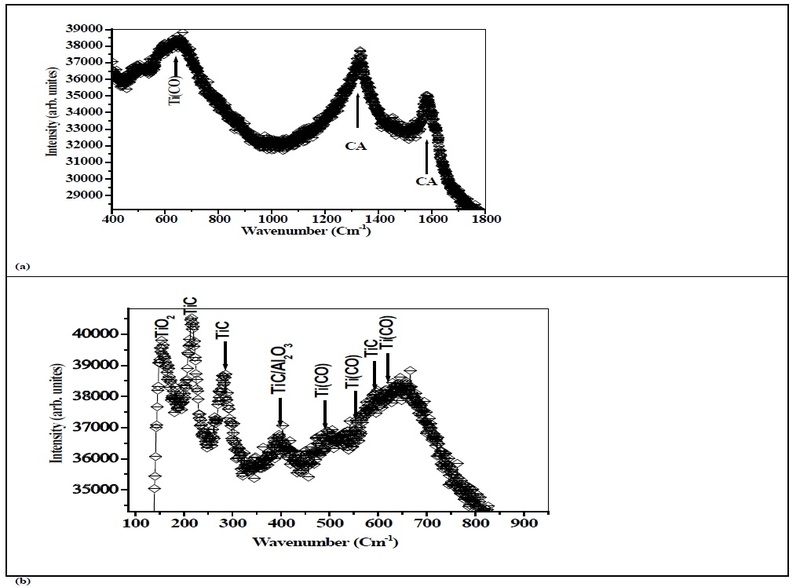 Figure 8: Raman spectroscopy analysis of samples with 20 wt.% Fe and d: Raman spectra of TiC and Carbon active in samples with different Fe contents. In the Figure 6, the microstructural representation and EDS analysis displays elemental analyses of the various regions of the samples. Secondary electron image, atomic concentration cartographies of Ti, C, Al and C are also illustrated. EDS spectra and was used to determine the elemental composition of the different regions in the sample with Fe addition and are presented at the Figure 7. Raman microscopy is able to determine phases for polymorphic solids at the microscopic level. This is its advantage over conventional X-ray diffraction spectrometry in which the sample volume cannot be too small. Phase identification with Raman spectroscopy uses the characteristic vibration band(s) associated with a certain phase in a solid. This analysis is founded on the Raman scattering of electromagnetic radiation by atoms and molecules. When irradiating materials with electromagnetic radiation of a single frequency, the light will be scattered by molecules elastically and inelastically. The inelastic scattering is called Raman scattering and can be used to determine details of the structure of the molecule or crystal lattice . To study the reaction products more precisely, micro- Raman spectroscopy analysis was performed on different samples. Some Raman spectroscopy analysis on titanium carbide [31,32] reported that the stoichiometric titanium carbide has no Raman active mode and the Raman scattering in this carbide is caused by the disorder induced by carbon vacancy. Figure 8a shows the results of the Raman spectroscopy analysis in the samples containing 0, 10 and 20 wt. % Fe, respectively. In the sample without Fe, five different peaks can be observed (Figure 8a). The first three peaks between 244 and 255, 414 and 422 and 598 and 601 cm-1 are related to the titanium carbide, which is almost the same as those reported by Lohse et al. and the two peaks between 1300 and 1600 are related to the un-reacted free active carbon (Figure 8b). There is no separate characteristic peak related to Al2O3. Cava et al. reported that Al2O3 with a cubic crystal structure has no Raman active mode while α-Al2O3with a hexagonal crystal structure has two Raman active modes with characteristic peaks at 380 and 420 cm−1. As shown by XRD analysis, the synthesized alumina in all samples has a hexagonal crystal structure and thus should have two characteristic peaks. But, it seems that these peaks have overlapped with intense TiC characteristic peak at 420 cm-1 and could not be observed in these spectra. The addition of 10 wt. % Fe to the reaction led to the formation of a new peak at 266, some peaks between 340 and 384 cm-1 and two new peaks at 517 and 634 cm-1. Also, there is a broad peak between 278 and 351 cm-1, a new peak at 649 cm-1 and a broad peak between 680 and 950 cm-1 in the sample containing 20 wt.% Fe. By comparing the results of this table with the Raman spectra in Figure 8a, it can be concluded that besides TiC and un-reacted carbon, there is a little TiO2 with two weak characteristic peaks at 517 and 634-649 cm-1. Also, some peaks between 266 and 384 cm-1and two broad peaks between 550 and 620 cm-1 and 680 and 950 cm-1 are symptoms related to the formation of titanium oxy-carbide (Ti (C, O)) in the final products. Getting hold of the results of XRD and Raman together, it can be concluded that the addition of Fe to reaction 2 led to the increase of oxygen content in the crystal structure of TiC and formation of titanium oxy-carbide with lower lattice parameter [34-38]. In Raman spectroscopy, the intensity of phase characteristic peaks is dependent on its quantity. Figure 8a compares the mean spectrum of the free carbon in the samples synthesized with different Fe contents. It can be seen that the addition of Fe to the reaction increased the mean intensity and surface area of un-reacted carbon characteristic peaks. So, one can anticipate that the volume fraction of unreacted carbon is higher in the sample with more Fe content. According to the above results, it can be concluded that the Vickers hardness has been improved by adding % Fe and annhanced with the fracture toughness value giving a better ductility for the reinforced high performance ceramic matrix composite samples. Figure 9 shows the hardness as a function of the applied indentation load for the same sample. The Vickers hardness increases with the increasing of the wt% of Fe addition. At lower loads, the microhardness reaches a low hardness a constant value of 47.55 GPa at 40 wt% of Fe at HV50 of the high performance ceramics matrix composites. Representation the variation of Vickers microhardness fonction of the indentation leads of the sintered samples using a 20-mm. 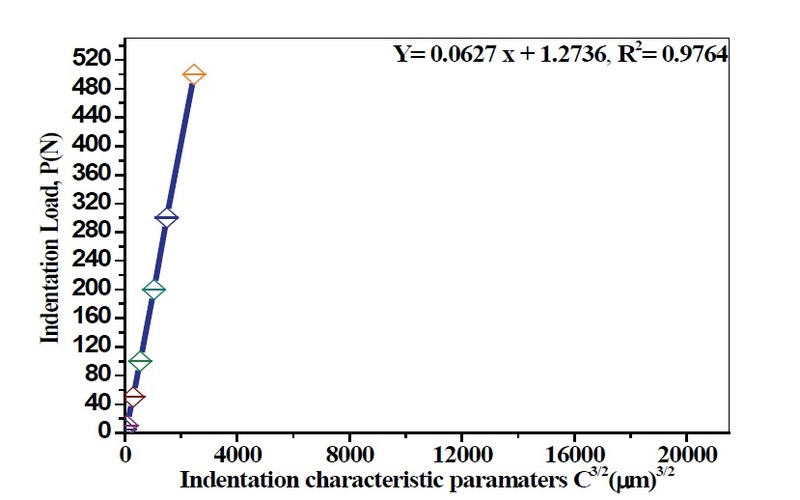 Figure 9: Representation the variation of Vickers microhardness fonction of the indentation leads of the sintered samples using a 20-mm. Figure 9 present the variation of Vickers microhardness of the product of reaction 2 with and without Fe addition op to 40 wt. Fe high performance ceramic matrix composite with the indentation lead. The microhardness of the composites increased almost linearly with Fe addition. The hardness of Carbon (28-30 GPa) is nearly 2 times the previously reported values of hardness of TiC (18 GPa). For the nearly single phase Al2O3 in this investigation, the microhardness was found to be 8 GPa (measured with indentation load of 300 N), which is higher than the previously reported hardness values for hexagonal in the literature. The microhardness of Fe3Al is 9.8 GPa While the higher microhardness of the TiCAl 2O3-Fe3Al-C composite ceramic matrix is at higher wt. % Fe addition [39-42]. The highest Vickers microhardness in the range of about 15 GPa was found for lower loads (10 N). 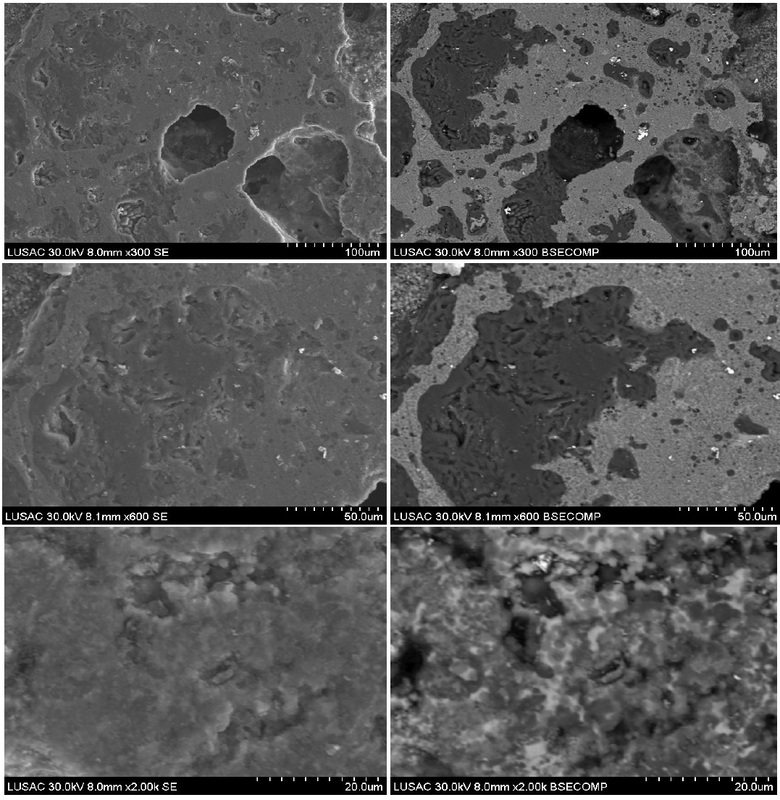 A slight increase in average microhardness have been obtained from composites prepared by volume combustion reaction exhibited highest hardness of about 6.50 GPa was found for higher loads (500 N) at higher Fe addition. 40 wt. %. The relevant data were listed in Table 2. In Figure 10, a linear regression analysis was applied to the relations of P and c3/2 by the least square method. Table 2: Data of Vickers indentation cracks and fracture toughness (KIC). Correlation in between the applied load P and half-length of median crack c3/2 of polished and etched surface for the sintered samples using the (IF) method. Figure 10: Correlation in between the applied load P and half-length of median crack c3/2 of polished and etched surface for the sintered samples using the (IF) method. As a result, the calculated slope A and intercept B were 0.0627 and 1.2736, respectively. The indentation fracture toughness was calculated to be 4.30 MPa m1/2 for 40 wt. % Fe addition ceramics matrix composite (CMCs) with excellent wear resistant will be confirmed. The addition of Fe plays a important role in sintering additive (the ductility) in the propagation of failler in this nanocomposites and thus enhance the fracture toughness in comparison with his higher hardness In addition, a high determination coefficient (R2) of 0.9764 was obtained through the linear regression model . IF (indentation fracture) was shown to be an effective method in the evaluation of fracture toughness for its convenience and material saving. Thermodynamic calculations predict that if the amount of Fe is lower than 53.13 wt. %, the reaction ignition and volume combustion mode processed. Phase analysis using XRD and Raman spectroscopy indicated that Fe3Al, Ti(C, O) and Al2O3 in addition TiB2 with some residual un-reacted carbon were the main products of the synthesis in the samples containing wt. % Fe. These products were not the same as those expected earlier. Using Raman spectroscopy analysis, it was demonstrated that all the carbon did not react with Ti in the sample containing no Fe and therefore the C/Ti ratio in the TiC phase was less than unity. This led to a lower lattice parameter for the synthesized TiC in comparison to stoichiometric one. Also, the lattice parameter of Ti (C, O) phase was lower in the samples containing higher Fe, likely as a result of dissolution of higher oxygen in this phase. Microstructural observations showed that additions of Fe changed the growth controlling mechanism of TiC particles. The adiabatic temperatures calculated using the thermodynamic data of the new products function of 10 to 40wt. % Fe content were in conformance with the Merzhanov criterion. We are grateful to Aurélien Lepeutrec and Ibrahim Itaalit (LUSAC, EA 4253, Université de Caen Basse-Normandie (UCBN), Cherbourg-Octeville, France) for the helps in the FESEM.